Looking East ! Another low descends in the Bay. Though I am not numbering it yet, maybe wait for it to deepen a bit, it is very much there off the North Orissa/W.Bengal coast at 1000 mb. We shall wait till tomorrow to see what happens, but I expect it to strengthen by tomorrow,and remain in position. The monsoon axis is much too down south today, over Gujarat and running thru Rajasthan and Orissa into the low pressure in the bay. The seasonal low over the Sindh/Rajasthan region is at 996 mb,and stretches up to Gujarat. The line joining the 2 lows is attracting much of the rainfall. Strong winds, exceeding 30 knts, are brushing the southern periphery of the low. 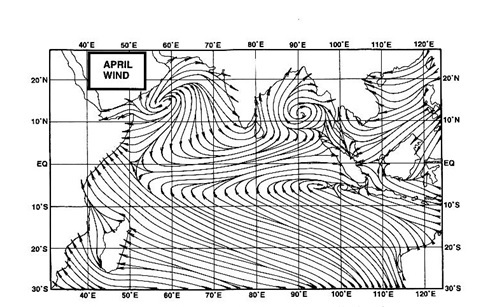 These winds are curving anticlockwise around the "greater Low'. NW along the Sindh coast till SW Gujarat, and then SW along the North Konkan (hence the windy conditions inMumbai) and adjoining south Gujarat coast. Winds are expected to touch 40 knts in the same region tomorrow, and by Wednesday, Saurashtra Peninsula will be wind swept, with westerlies. Strong moisture laden winds has led to the formation of a thick cloud mass off the south Sindh and Gujarat coast on Monday. Now developed, this mass of cloud should move NE, into the sindh coastline, and adjoining Gujarat coast on Monday/Tuesday. Heavy rains could be expected in coastline sindh and Lower Sindh on Tuesday. However, winds along the sindh coast will ease by evening as the low weakens. Karachi had another hot day, at 38c, with Nwinds throughout the day. Could expect a thundershower tonight, and some on Tuesday and Wednesday as well. Would estimate somewhat heavy showers, and rains may be around 15 mms. Western Gujarat coast, and part of western Saurashtra can get heavy rains on Tuesday, decreasing by Wednesday. Expect some increase in rains also in N.Konkan on Tuesday and Wednesday. Interior Mah. and Karnataka rainfall will be minimal. A few thundershowers due to development of isolated thunder cells may pop up at a few isolated pockets. No "system" rains on an "organised" scale. As the precipitation caused by Easterly moisture has been triggered by the erstwhile BB5, we may see some of it continuing on Tuesday in Delhi, U.P. and moving into Nepal on Tuesday. Overall decreasing by Wednesday. On Monday, Mumbai had a partly cloudy day, with sunny intervals and a few passing showers. Sunday had seen 19 mms and 13 mms at Colaba and S'Cruz resp. But Monday measured only 2 mms and 3 mms respectively. Tuesday: As explained above in the article, with the winds increasing speed on Tuesday along the N.Konkan coast, we may see more showers on Tuesday as compared to Monday. Frequency of rain will be more (don’t expect too much) from late afternoon, and some showers tending to get heavy and with gusty winds. Thunder possible with some showers. Rain amount 20 mms. Wednesday: A let up in the winds. And so a marginal decrease in the rainfall. A few showers on Wednesday. Rain amount 10-15 mms. Pune had a cloudy day, with the high at 27c. Light rain in the day measured 0.5 mms. Tuesday/Wednesday: cloudy day, with light drizzles in some parts. Thunderclouds developing by evening, when a shower is possible in some parts. Pavan: Pune weather is as per vagaries forecast.Convective rains in the evening, not due to any system yet.